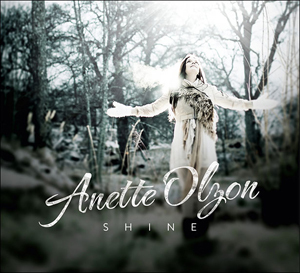 The debut album from former NIGHTWISH singer Anette Olzon is a hit and miss affair. Fully half the album sounds as if she was reaching for some semblance of the sonic heights of her former band (if not quite getting there) while the other half comes off as a slightly misguided attempt at a more palatable pop sounding disc. The album's material was co-written by Olzon and collaborators Johan Glossner and Stefan Orn. The latter two are heavily involved with all aspects of Shine from the songwriting to playing the majority of the guitars, bass and drum tracks. Orn was also involved in the string arrangements on two of the songs. While this much "outside" involvement might raise questions as to how much of a SOLO project this really is for Olzon, her voice is what brought me to the disc. The vocals are a clarion call, continually to be a cool and crisp breath of fresh air, regardless of what I might think of the individual tracks. While in NIGHTWISH, Olzon recorded two albums with the band. While I wasn't all that interested in Imaginaerum, the album Dark Passion Play was for my money one of the best albums the band has ever done, and it was Olzon's vocals that really drove that album home for me in particular. And therein lies the biggest problem I have with Shine. I was fully aware that her solo album was not going to sound like a NIGHTWISH CD, but I don't think I could've truly been prepared for just how radical a shift in musical presentation this album was going to turn out to be. While her voice continues to provide moments of eternal beauty, there were spots that made me want to scream. The song "Floating" has this slow almost flirtacious vibe to it and the teasingly coquettish way the vocals are performed make the entire enterprise of the song rather annoying. Songs like the title track and "One Million Faces" feel as if they are going to bust loose into full on rockers at any moment, but it never happens. The undercurrent of promise in these two tracks is left unfullfilled and leaves you feeling a bit hollow. The title song in particular sees the drum and guitar tracks combine to give a heightened anticipatory and even predatory feel that never develops into full bloom. Not all of the more pop oriented material is lacking though. The slow ballad that closes the album, "Watching Me From Afar" is quite good. Meanwhile, the first part of "Moving Away" is a pure pop that eventually grows stronger in tempo after the first verse and continues that way until the end of the track. The a cappella start to "Invincible" lets Olzon's voice stand alone as a powerful reminder of just how good she can sound. The epic sounding string arrangement on "Like A Show Inside My Head" gives the slightly plodding track a far better feel than the song would've had without it. The song "Lies" is the one track that comes closest to sounding like a song in the vicinity of NIGHTWISH material. The strong opening musical salvo fuels the rest of the song. The edgier sense of melody to "Falling" and the musical soundtrack for "Hear Me" help acquit those songs superbly. Despite knowing I wasn't going to get a NIGHTWISH-lite CD here, I can't help feeling a bit disappointed that Olzon has a more pop or lighter rock solo album in Shine. The more rocking songs are generally good and make for repeated listening enjoyment. But I think Olzon would've been better served by cutting loose a lot more both vocally and musically. If that had happened, she would've rocked the socks off anyone who heard this album.